Look no further in Logan Square! Gut rehabbed in 2006, this bright garden unit is only two steps down. Sunny living/dining room with spacious bay and gas fireplace. Diagonally laid hardwood floors throughout visually opens the space. Custom Italian wood cabinet kitchen with large island, granite counter tops & stainless steel appliances. Master bedroom has in suite marble bath with large whirlpool tub and separate shower. Bright second bedroom plus marble second bath. In unit laundry. Private patio for grilling. Easy street parking on this leafy residential street. 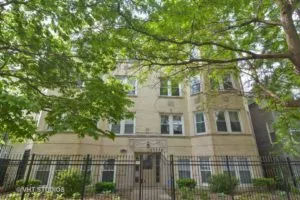 Walk to Wyler road, blue line el, grocery store, shopping, restaurants, Palmer Square Park and all Logan Square attractions. Don’t miss this one!